"Hello everyone, the cottage is under renovation from January 6th to the end of April 2019. We wish to set up a relaxation area with spa / sauna, a games room. A fourth room called "family" will be available also. We will decorate the announcement with some photos as the project progresses. For any rental request you can now access the 2019 schedule and the request for information. A plan is also available to you to better visualize this unique place "
Located between Terre and Mer in the commune of Saint-Georges-de-Pointindoux in Vendée. 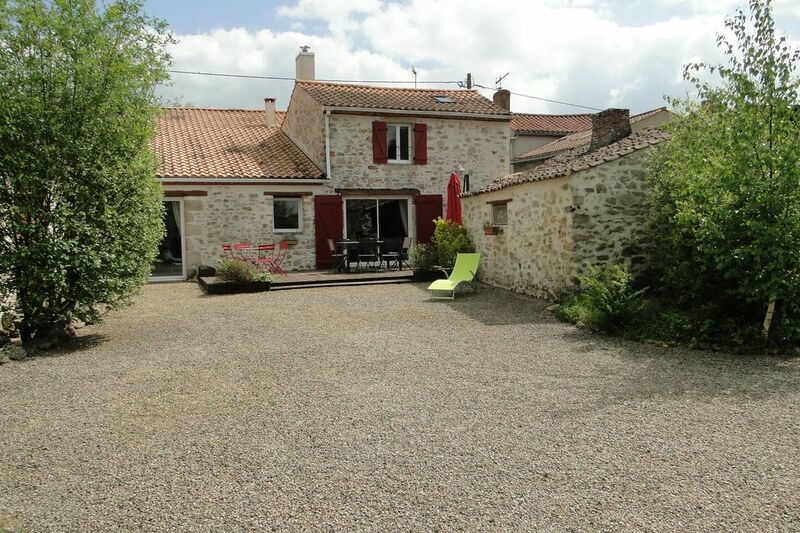 The cottage Hermione invites you to discover all that the Vendée has to offer. Want to calm and love nature? Beautiful walks and hundreds of hikes await you. Want to escape and wide open spaces? Enjoy the miles of wild coastline that runs along the department. Feel like thrills and fairy tales? Large amusement parks and adventures you will find. We are waiting for you, in this unique place, where there is tranquility, a taste for sharing and discovery. House of 340m2. On the floor, 3 rooms (room 1: 1 bed 160x200 / room 2: 1 bed 160x200 / room 3: 2 beds 90x200 with possibility of twinning in 180x200), 1 room of water with TOILET, Mezzanine with corner relaxation (library and chairs). On the ground floor, 1 kitchen (dishwasher, cooking robot, gas stove and electric oven, microwave, coffee maker, kettle, toaster ...), 1 living room (2 sofas 7 people, TV, home theater with player DVD blu ray, a wood stove), 1 storeroom (washing machine, dryer, ironing board, vacuum cleaner), 1 toilet, 1 family room with 1 bathroom (shower and bath) +1 wc + 1 bed 160x200 + 1 bed 90x200 + 1 cot. Relaxation and rest will be de rigueur in the wellness area with a spa for 5 people and 1 sauna for 3 or 4 people. You can call on beauticians (subject to availability) and enjoy the care they offer in the massage room. For table tennis and table football fans we have rehabilitated an addiction to have fun. Also shuffleboard, petanque, darts, möllky. Outside, fenced garden with terrace and barbecue area. But also ... 1 garage with possibility of parking 2 vehicles. Baby equipment: high chair, cutlery, bath, small pot, changing table. Paid service: 9 beds (including cot) are available in the accommodation, an extra bed for the 10th person will be charged. Located 10 minutes from the Grand Défi, 25 minutes from O'Gliss Park and Vendespace, 45 minutes from Puy du Fou. For beautiful walks to the sea: 20 minutes of Les Sables d'Olonne, Brétignolles and Saint Gilles Croix de Vie. Gites très confortable et accueil très chaleureux . C'était un grand plaisir de vous accueillir. Vous avez su prendre soin de notre gîte et nous vous en remercions. Nous vous souhaitons encore une bonne et heureuse année à vous tous. Beau logement. Très spacieux et joliment décoré. Nous avons été ravis de vous accueillir pour le week-end du 01 novembre. Nous vous remercions pour votre commentaire. Cordialement. Nous vous remercions pour ce joli mot. Nous avons été ravis de vous accueillir et le gîte l'Hermione vous ouvrira encore ses portes si vous le souhaitez et en découvrirez ses nouveaux trésors. Wir waren sehr beeindruckt von dem , mit Geschmack eingerichteten und voll ausgestatteten Haus. Die Lage ist sehr ruhig in einem kleinen Ort. Der erste Eindruck bei der Ansicht von Außen war nicht so überzeugend, weil das Haus schon sehr alt aussieht, umso mehr waren wir überrascht von der großen Räumlichkeit, Sauberkeit und Ordnung innen. Wir wurden sehr freundlich empfangen und nach einer ausführlichen Einweisung haben wir uns über den ganzen Urlaub hier sehr wohl gefühlt. Als einziges Manko vielleicht: keine Einkaufsmöglichkeit vor Ort für Leute, die nicht gerne Auto fahren wollen. Ein Lob der Gastgeberin und vielen Dank. Merci pour votre commentaire. Nous sommes conscients que la façade de la maison peut ne pas être très attirante. La maison date de 1900. De ce fait, nous avons prévu dans les mois à venir d'y remédier. En ce qui concerne les commerces, dans le bourg le café fait dépôt de pain. Les grandes surfaces, poissonnerie, boucherie, boulangeries, services médicaux, poste, banques se situent à 5 kms. Nous avons été ravis de vous accueillir et nous vous remercions pour votre franchise et vos mots touchants quant à la description de la maison et de l'accueil. Un bonjour à toute votre famille. Cordialement. Located 10 minutes from the Grand Défi, 27 minutes from O'Gliss Park, 45 minutes from Puy du Fou. For beautiful walks to the sea: 20 minutes of Les Sables d'Olonne, Bretignolles and Saint Gilles Croix de Vie and walks on foot or bike around Lake Jaunay 10 minutes.